Asheville, NC, is a beautiful tourist destination full of life and excitement! It is the perfect destination to take the entire family. We created a list of a few amazing activities/shops that the city has to offer that are family friendly! The Western North Carolina Nature Center is a living museum of plants and animals local to the Appalachian region. They have events planned throughout the year, and it is a great place for kids to learn and understand more about nature and the environment through hands-on and sensory programs. One of the most popular attractions in Asheville, at 175,000 square feet and 250 rooms, it’s the largest house in America. The Biltmore Estate consists of the Biltmore House, the winery, and the manicured garden. It's a great day trip for a family! Kids and adults can enjoy roaming around the property of more than 8,000 acres (including a petting area at the farm). Also, there are plenty of activities provided throughout the year. Hours and Prices available HERE. Stay with Carolina Mornings and receive a FREE Daily Biltmore Estate Ticket (Value up to $85). Children 9 and younger are always free with adult admission. The Mountain Play Lodge is great, especially for rainy days! It is clean, safe, fun, and provides kids a place to let their imagination run wild! It includes a huge treehouse jungle gym, unbelievable soft-foam sculptures, and realistic playhouses! The great thing about the Asheville Pinball Museum is that once you pay admission, you get to play any game you want for free! It is a great deal to play a wide variety of vintage games. There are more than 30 machines that range from 1960 to 2003. There are even a few novelty games you can play, such as a rifle game and baseball game! This French Broad River Rafting trip starts with swift-moving rapids and big-sky mountain views as it flows through scenic Pisgah National Forest. The first 5 miles feature fun Class II-III water on rapids like Pillow, S-Turn, and The Ledges. After the first half of the trip, your river guides treat you to a swim break plus a delicious and freshly prepared riverside lunch. Then you continue forward for another 3 miles of excitement, including the biggest rapids of the day: Kayaker’s Ledge and the Class IV grand-finale “Franks Bell's Rapid.” This trip is one of the best things to do in Asheville, NC. D-BAT Asheville is an indoor training facility including 3 machine cages that use real baseballs and softballs and 6 non-machine cages that can be rented. They are a great way to work your kid out individually or bring in a team for batting practice. Cage Rentals are rented out on 1/2-hour increments. Each cage comes equipped with Baseballs/Softballs, "L-Screen," and a batting tee. All the pitching machines will accommodate baseball along with slow pitch and fastpitch softball. Click Here for pricing details. Chimney Rock State Park - all 4,000 acres of it - will awaken your sense of adventure. Special events include "Off the Beaten Path" guided hikes, live music concerts by artists such as The Swayback Sisters, and sports challenges like the annual Race to the Rock that takes place in August. At Grady's Animal Discovery Den, Grady the Groundhog invites little ones to view local wildlife, such as non-venomous snakes. Kids are also treated to educational handouts about the park's geology, birds, and wildflowers. Bring the family dog, too - Chimney Rock is pet-friendly! Held outdoors at Pack Square Park in the heart of downtown Asheville, Shindig on the Green is FREE and was voted the #1 Local Outdoor Concert in the Mountain Xpress "Best of WNC" survey for four years. Bring your instruments, your lawn chair or blanket, family, and friends to join the fun for these eight summer Saturdays. The Hop Ice Cream Cafe has been proudly serving Asheville since 1978 with an imaginative yet classy array of homemade 16% butterfat dairy ice cream, completely from-scratch vegan ice cream and sorbet, fair-trade/organic coffee and espresso, unique specialty desserts and more. In addition, The Hop hosts a variety of birthday parties, weekly free family-friendly entertainment, and whimsical special events at each of its three Asheville locations. Asheville’s Fun Depot is a mostly indoor family entertainment center that features a variety of attractions and activities as well as a full menu of delicious food items. With more than 65,000 square feet of indoor fun, Asheville’s Fun Depot is the ideal place to spend quality time with your friends and family regardless of the weather. Attractions and activities include outdoor and indoor go-carts, 18-hole indoor mini-golf course, laser tag, bumper cars, a climbing wall, playgrounds and inflatables, mini-bowling, X-rider 4D Theater, arcade games, Aeroball, Lazer Frenzy, Atomic Rush, and so much more. Asheville Museum of Science (AMOS) has plenty of science to come and explore including our brand new Colburn Hall of Minerals, the STEM lab, our interactive panorama screen, the AMOS Mars Rover, our Teratophoneus dinosaur skeleton and fossil dig, Southern Appalachian Forest, Terrabox elevation simulator, Toddler Nest, Hurricane Simulator, fun temporary exhibits, and an exciting new gift shop! Want to explore the place where learning comes into play? This children’s museum located on Main Street in downtown Hendersonville is just the place. Hands On! provides educational exhibits and programs for children ages 1–10 and is a great way for families to spend the day together in a fun and affordable environment. As you walk through the front doors, you are immediately captured by the mountain exhibit where children can roam up and down the mountain, and there are spots to play in the water. Just the sound creates a very friendly environment! All the rooms of different scenery and role-playing can stretch out any imagination of play for children. There is even a theater with dress up options. Creative play is what Hands On! is all about! The Great Smoky Mountains Railroad offers scenic train excursions through the NC mountains along Nantahala and Tuckasegee Rivers, across valleys, and through tunnels. All the train rides depart from the depot in downtown Bryson City (near Cherokee). Their variety of trips and special event trains (like the Polar Express) are perfect for making memories! Ride in vintage open-air cars, climate-controlled cars or first-class with dining options. Click Here to check out the train schedule. Enjoy a game in the historic McCormick Field, where some scenes from the movie "Bull Durham" were filmed! The Asheville Tourists is our minor league baseball team with a downtown stadium. They are a Class-A team in the South Atlantic League and have been a farm team of the Colorado Rockies since 1994. McCormick Field, which opened in 1924, seats 4,000 fans and is often joked about because of its scoreboard, which reads "Visitors" in the guest slot and "Tourists" in the home slot. Munch peanuts and Crackerjack and enjoy some good ole baseball! Thirsty Thursdays are fun for adults with $1 beer, and the Dollar Dog Nights are a sure win with the kids. Check out upcoming games and promotions for the Asheville Tourists. Everyone is welcome to come play in Splasheville! This interactive water feature delights children with its 21 jets of water that run in 12 combinations. You never know where it’s going to splash you next! Carolina Mornings is Asheville's #1 Award-Winning Vacation Rental Company! 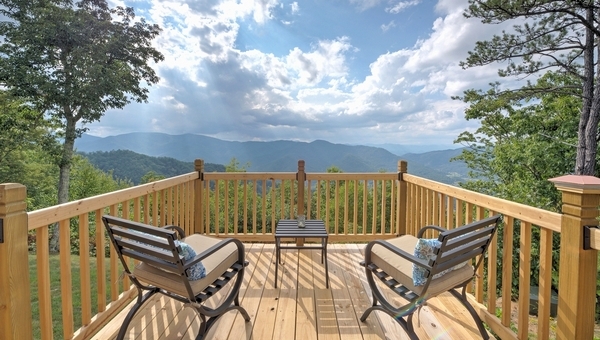 Staying in our vacation rentals will give you the luxury of experiencing mountain living. Spread your wings and enjoy the great food, beautiful sights and sounds of our town while staying at one of our lovely furnished rentals. Whether you are wanting to be in the heart of all the action or secluded on a mountaintop, we have it all! Call our Vacation Planners to help you experience the comfort of the mountains.